The Meatpacking District is putting the jolly spirit back into holiday shopping with the inaugural Very Merry Holiday Hours! For one night only, 35+ local businesses will keep their doors open later and offer exclusive holiday shopping experiences and discounts. Organized by the Meatpacking Business Improvement District, Very Merry Holiday Hours will take place on December 14, 2017 from 6:00 – 9:00pm and is open to the public. During these very merry hours, locals and visitors alike can complete their holiday shopping in a joyous atmosphere at their favorite retailers, while also becoming eligible for free gifts and discounts! 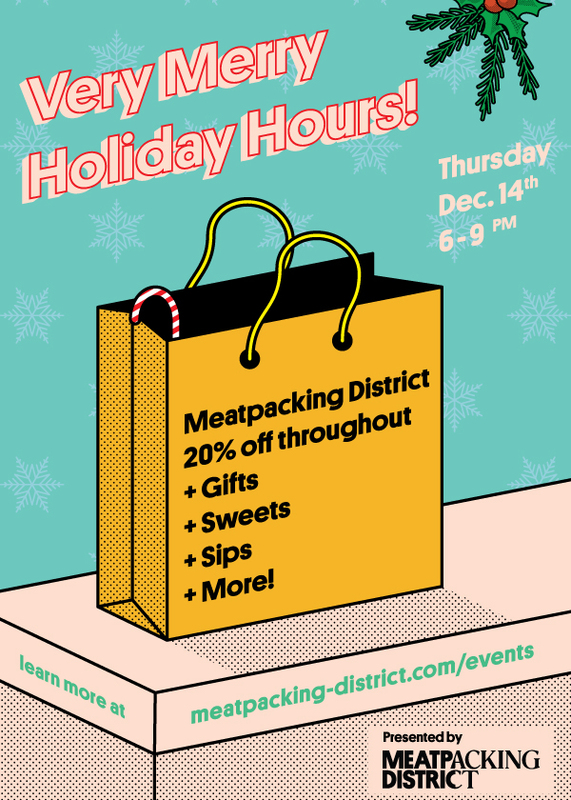 Participating shoppers who present their purchase receipts from the event can redeem special prizes from the Meatpacking BID at the Very Merry Headquarters located within Little West Wines (19 Little West 12th Street). Sign up for the Meatpacking District neighborhood newsletter on site. To kick off this spectacular shopping extravaganza, Theory will be hosting a special cocktail reception to celebrate the holidays with co-hosts Matt Cavanaugh and Kathleen Scudder of Heavy Eyes, the artists behind the ‘winterscape’ paper sculptures seen in Theory stores nationwide. 20% off apparel, accessories, gifts and more at: Alice + Olivia, AllSaints, Calliope, Diane von Furstenberg, Eberjey, Exhale, Lie Sangbong / Blank Space, Lilla P, Madewell, Meg, Paige, Rag + Bone, Rebecca Taylor, Reign, The Kooples, Theory, Tory Burch, Trina Turk, and Vince. Select sales and discounts + fun activities in jewelry, housewares, gourmet food, toys and more at: Artist + Fleas, Chelsea Market Baskets, Doyle + Doyle, Free People, Hanro, Heatonist, Kikkerland, Kiehl’s, Kore, Li-Lac Chocolates, Little West Wines, Lumas Meatpacking, Paper Source, Pearl River Mart, Reinstein Ross, The Filling Station, and T-Mobile. Restrictions and exclusions do apply, inquire within stores for more details. To qualify for the special gift at the headquarters, purchase receipts must be from December 14. For additional information, please visit: http://www.meatpacking-district.com/events/verymerry/.